iPower DC power supply by iFi audio. The Bryston BDP-3 digital player in my two channel stereo system is served music files from a Western Digital Black 6 TB hard disk drive that is placed in a Rosewill Armer RX304-APU3-35B fanned aluminum hard drive enclosure. The enclosure is powered by a generic wall wart type 12 volt/2 amp switch mode power supply AC-to-DC adapter. Switch mode power supply (SMPS) AC-to-DC adapters are known for producing large amounts of electrical noise. This noise is generally of little concern for computer applications. I wondered if a lower noise SMPS adapter designed for computer audio applications would provide better audible performance...and it did. Noisy SMPS notwithstanding, I was doubtful, and skeptical, that a lower noise power supply would provide any audible benefit due to the extensive electrical noise abatement measures employed in my two channel stereo system. However, prior to this study, I really didn't have a good understanding of just how much noise switch mode power supplies generate. Figure 1. 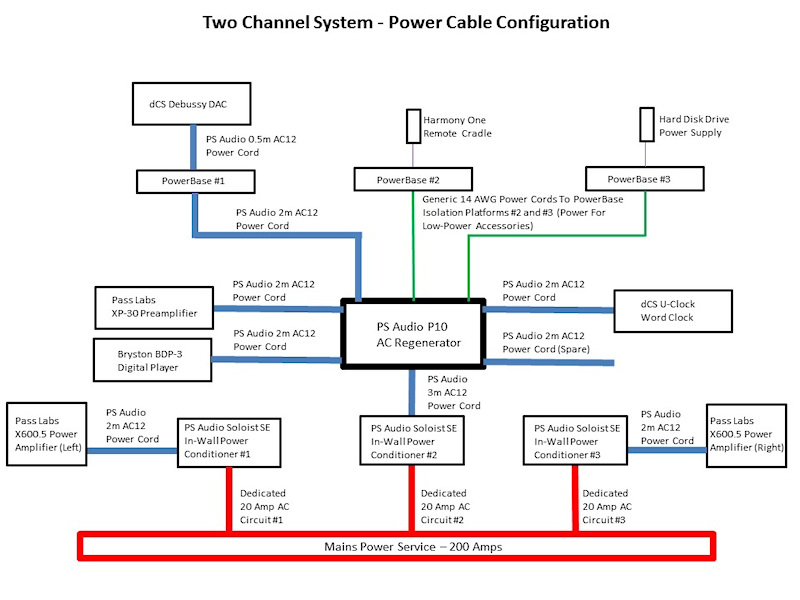 Two channel stereo system power plan. Figure 2. 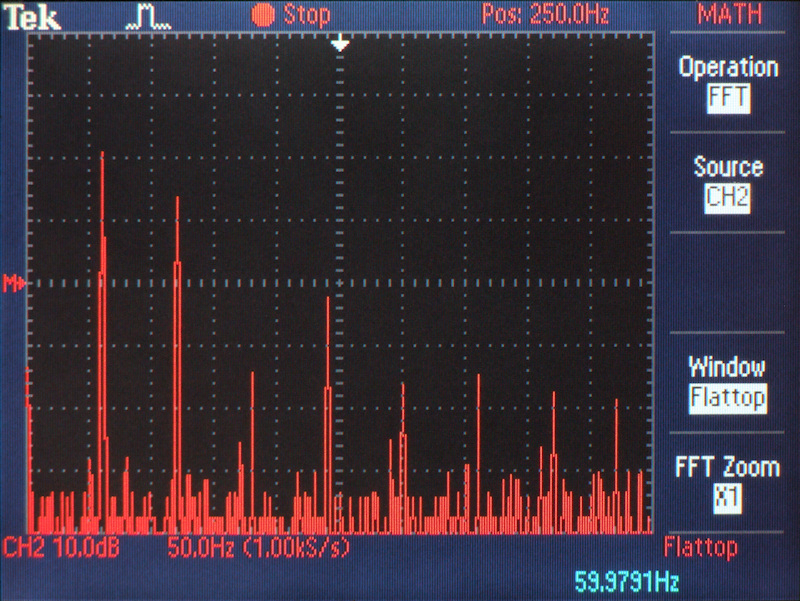 Power quality statistics from the PS Audio P10 AC regenerator. The electric power serving my home is exceptionally clean and stable, with total harmonic distortion in the range of 0.8% to 1.5% and voltage in the range of 121 volts to 123 volts. The AC regenerator feeds significantly cleaner power and constant voltage to the preamplifier, source components, and accessory components. The monoblock power amplifiers draw too much current (nearly 5 amps continuous each, at idle) for the AC regenerator to handle, therefore, the power amplifiers are plugged into the wall. However, each power amplifier has its own dedicated 20 amp AC circuit and the wall outlet of each AC circuit was replaced with a PS Audio in-wall passive power conditioner. Additionally, the two AC circuits for the power amplifiers are on different legs of the electric service. Figure 3. 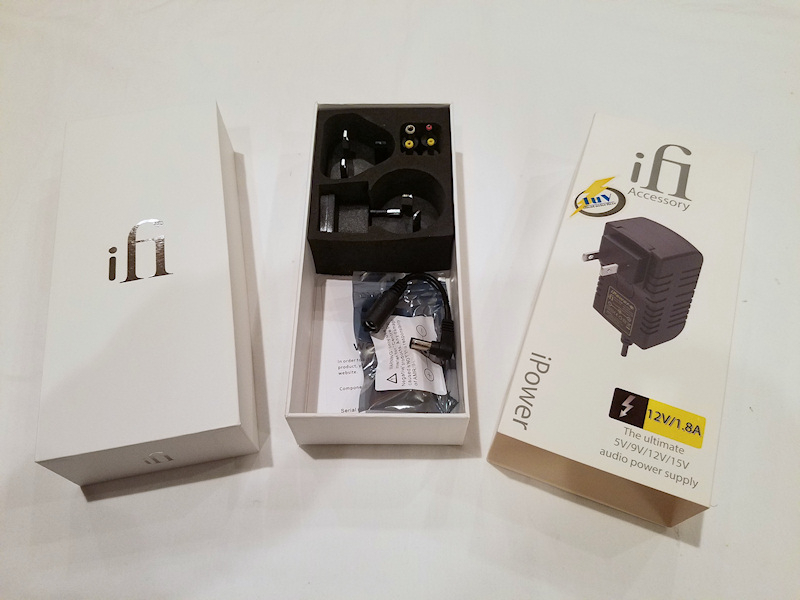 The iPower AC-to-DC adapter is manufactured by iFi audio. It is marketed as an audiophile-standard DC power supply. Figure 4. Left: iPower 12 volt/1.8 amps AC-to-DC adapter. Right: stock Flypower AC-to-DC adapter, model number PS30D120K2000UD, 12 volts/2.0 amps. Figure 5. 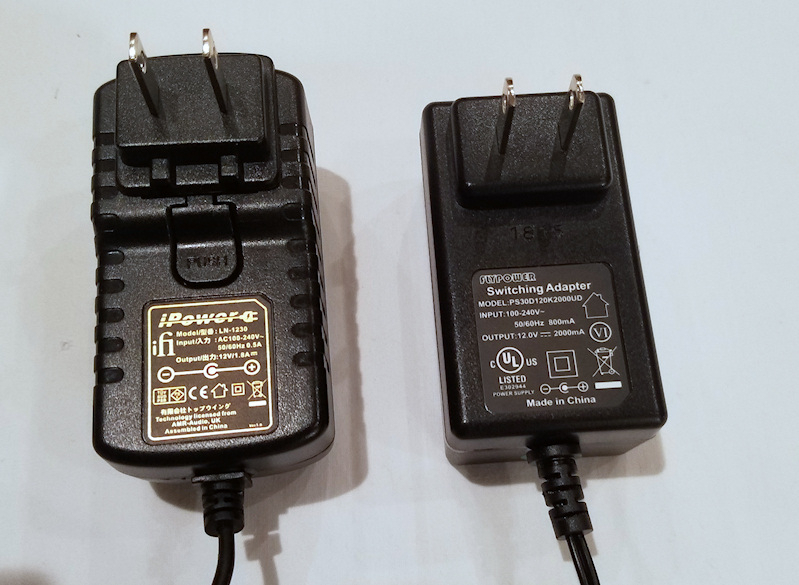 Label sides of iPower and Flypower AC-to-DC adapters. listening evaluation. Sound images were mapped and characterized during ten repetitions of the song. Figure 6. Sound stage maps with stock Flypower hard drive enclosure power supply. Figure 7. 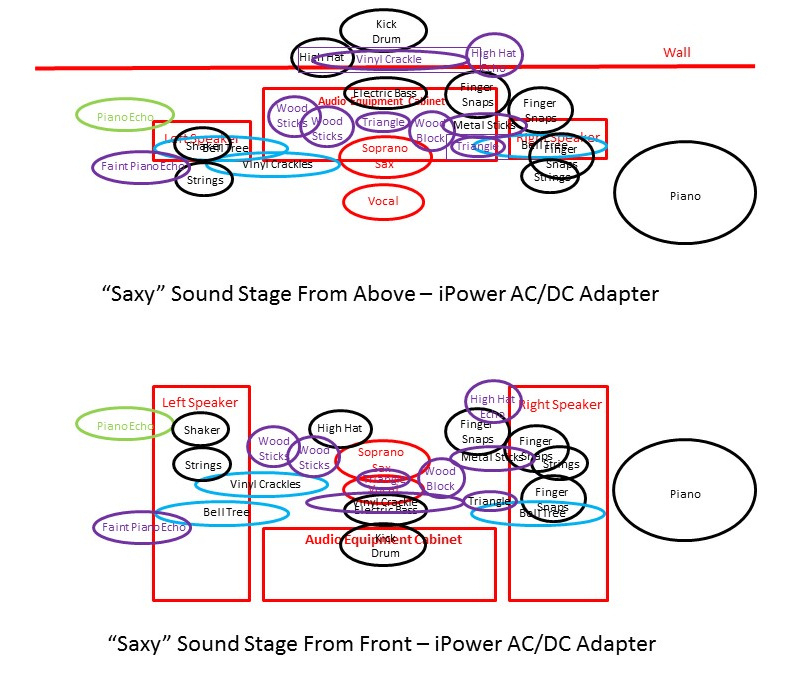 Sound stage maps with iPower hard drive enclosure power supply. The size and placement of instrumental and vocal images with the iPower AC-to-DC adapter was the same as with the stock AC-to-DC adapter. The clarity and detail of those images, particularly in the bass frequencies, was improved. There were some percussion instruments that were previously masked that were clearly and cleanly presented with the iPower. Those unmasked images are shown in purple in figure 7. 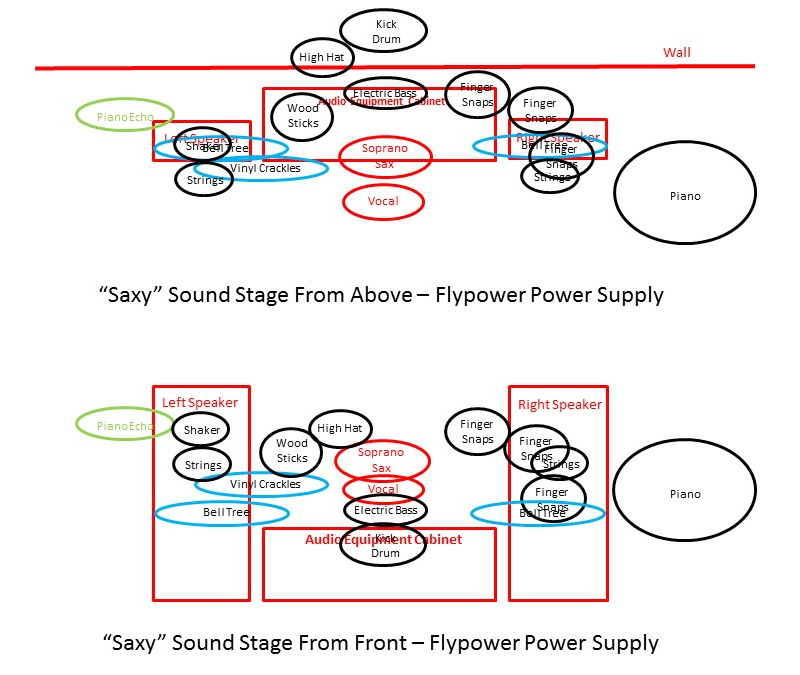 Although the sound stage maps in figure 7 look busy and cluttered, the sound was not busy and cluttered since the sounds occurred at different points in time. In particular, some percussion instrument images and ambient sound images, which were previously masked, only occurred infrequently. Toward the end of the song, the vinyl surface noise sound effect can be heard faintly at the rear center of the sound stage. This sound was previous masked by the synthesized electric bass and synthesized kick drum. The triangle was previously masked by the bell tree, wood sticks. soprano saxophone, and vinyl surface noise sound effect at the front of the sound stage. The wood block was previously masked by finger snaps, electric bass, and kick drum. The metallic sticks were very close to, and previously masked by, the leftmost finger snaps image. The wood sticks image to the left of the soprano saxophone was now rendered as two images, with the stick strikes alternating locations on successive bass beats. New echoes of the high hat and piano were also resolved. In addition to the above, there was more tongue, throat, and chest articulation and sharper transients in the male vocal, more fluidity in piano notes, and more detail in the reverb around the vocal and soprano saxophone. "Isunova Pi" - E. S. Posthumus - "Cartographer" album - this song begins with four thunderous drum beats at the 1, 7, 13, and 19 second marks. The decaying rumble and tactile sensation of the drum beats lasted 4, 4, 3, and 3 seconds respectively with the stock Flypower adapter. The decaying rumble and tactile sensation of the drumbeats lasted 5, 5, 4, and 4 seconds respectively with the iPower adapter. Drum beats were timed with a digital stopwatch. "Healing Song" - Gregg Karukas - "Heatwave" album - With the iPower, there was more rumble and growl in electric bass and drums, more reed sound in the tenor saxophone, more "gravel" and overtone texture in the organ notes, more clarity and detail in the piano notes. 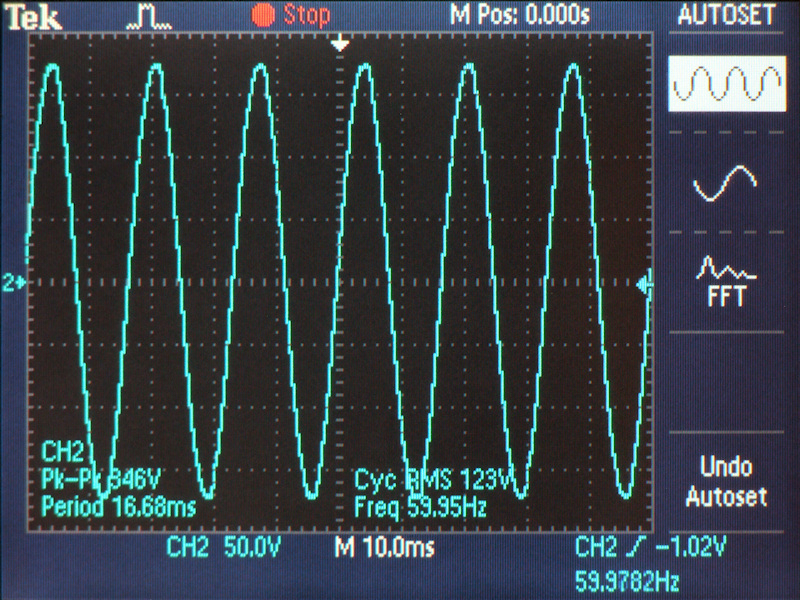 Time domain measurements were taken with a Tektronix TDS 2012 oscilloscope. Figure 8. Voltage signal from wall receptacle. Notice the flattened sine wave peaks compared to the more pointed peaks from the AC regenerator shown in figure 10. Figure 9. 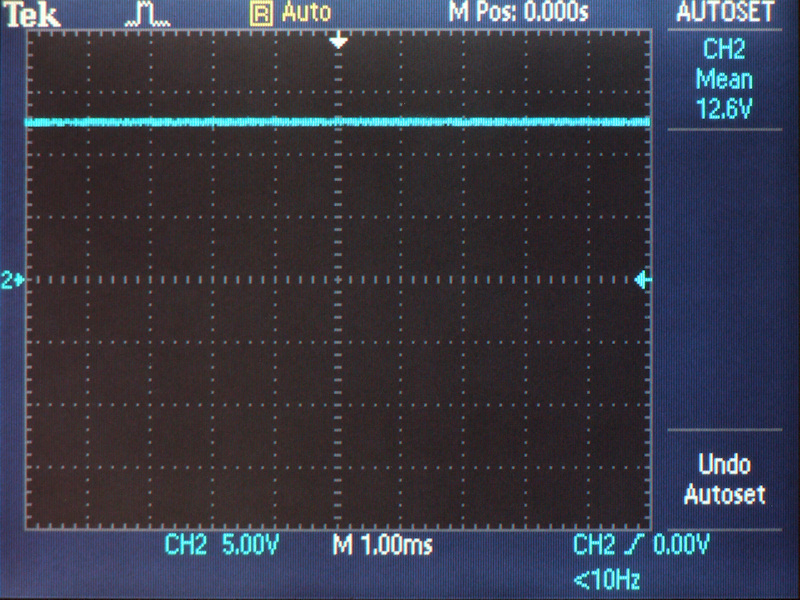 Closeup of voltage signal from wall. 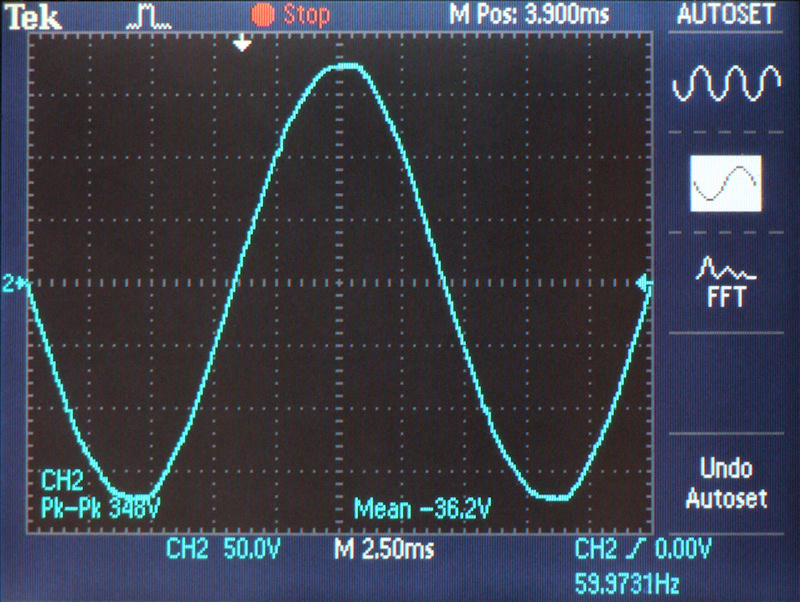 The flattened sine wave peaks are due to harmonic distortion and other electrical noise. Figure 10. 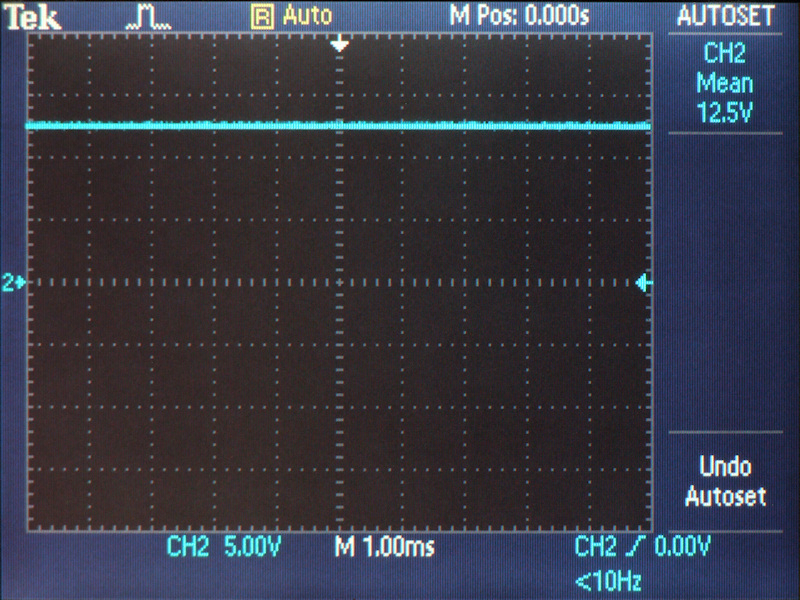 Voltage signal taken from the output of the PS Audio PowerBase that the hard drive enclosure power supplies were plugged into. This voltage was supplied from the AC regenerator. Figure 11. 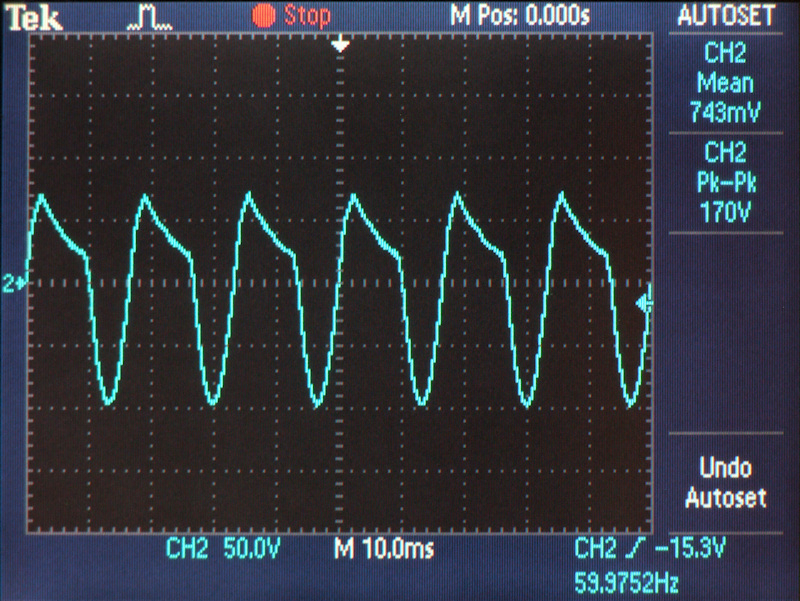 Closeup of voltage signal from AC regenerator/PowerBase. Figure 12. 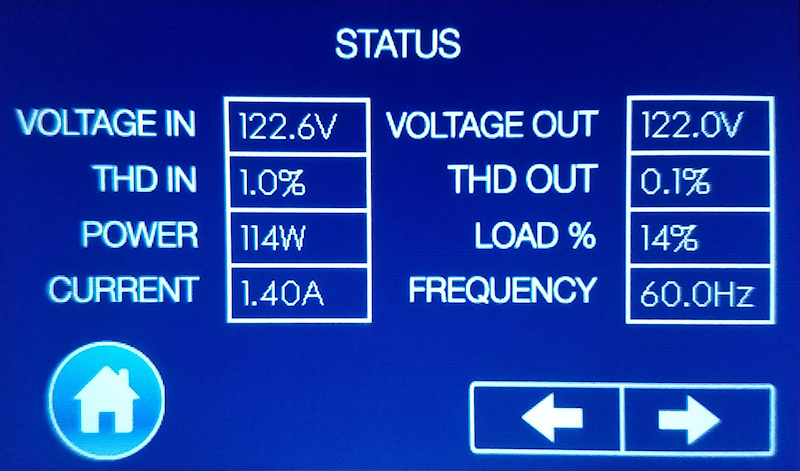 AC voltage at output of stock Flypower AC-to-DC adapter. 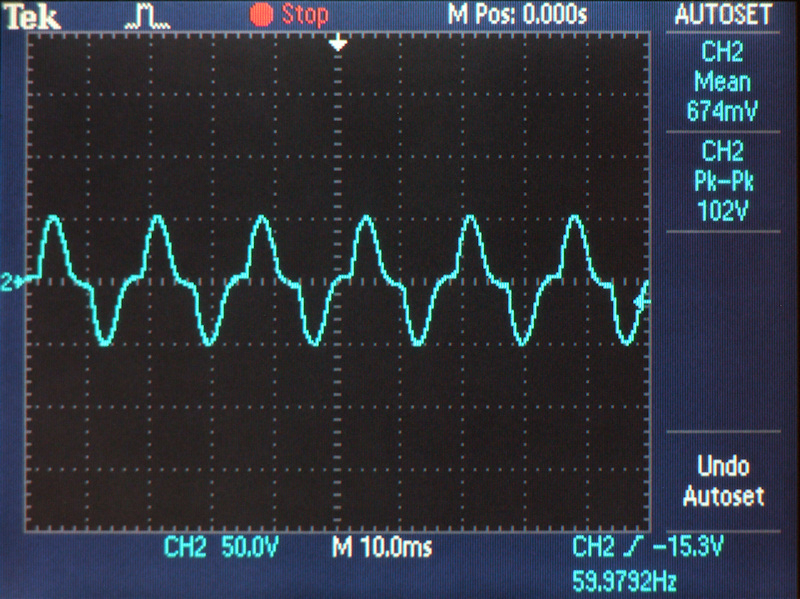 This asymmetrical waveform is typical of cheap switch mode power supplies with very high harmonic distortion (see figure 18). Figure 13. AC voltage at output of iPower AC-to-DC adapter. A smooth symmetrical waveform with significantly lower harmonic distortion content (see figure 19). The high AC voltages shown in figures 12 and 13 originate from the capacitance between the primary and secondary of the step down transformer. In a cheaply made AC-to-DC adapter, this AC voltage can be as high as half the wall voltage. However, the currents created are very low, on the order of microamps. 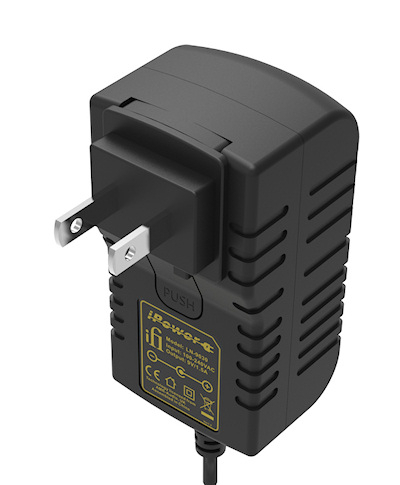 In the case of the Flypower adapter, the peak to peak AC voltage corresponds to 60 volts rms, which is close to half the wall voltage of 122 volts rms. The AC rms voltage at the output of the iPower adapter is drastically lower, at 36 volts. Figure 14. DC voltage at output of stock Flypower AC-to-DC adapter. Figure 15. DC voltage at output of iPower AC-to-DC adapter. Frequency domain (Fast Fourier Transform) measurements were taken with a Tektronix TDS 2012 oscilloscope. Each vertical dot represents 2 dB of voltage amplitude. Each horizontal dot represents 10 hertz of frequency. Figure 16. 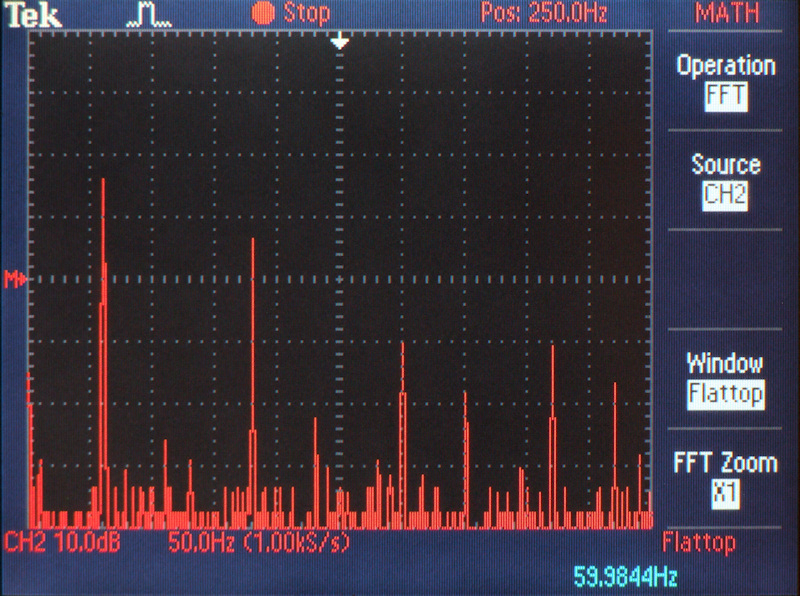 Noise spectrum plot of AC voltage signal from wall. Figure 17. Noise spectrum plot of AC voltage signal from AC regenerator/PowerBase. The odd order harmonics at 180 Hz (3rd), 300 Hz (5th), and 420 Hz (7th) shown in the wall voltage in figure 16 are significantly reduced in the output from the AC regenerator/PowerBase. The power company's signaling tone at 470 Hz is also significantly reduced. 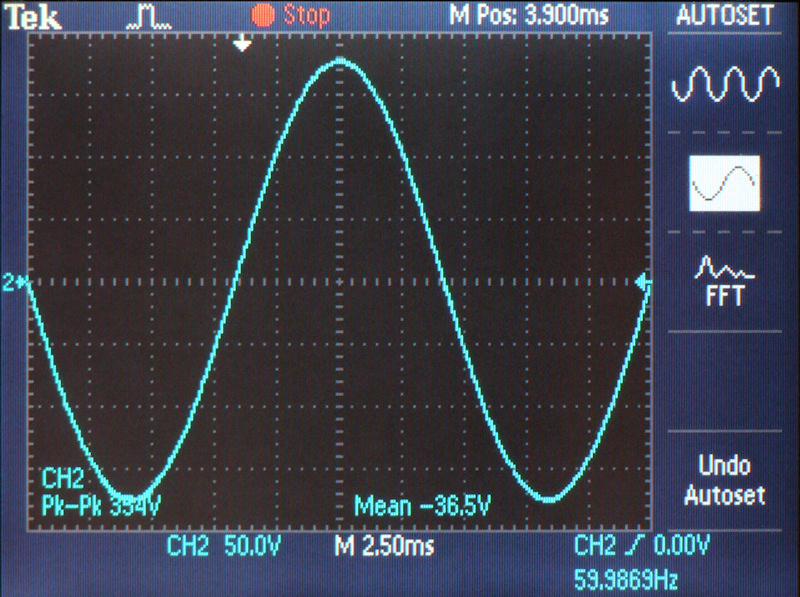 This reduction in noise (everything except the 60 Hz power signal is noise) results in the near perfect sine wave shape of the time domain power signal shown in figure 11. Figure 18. 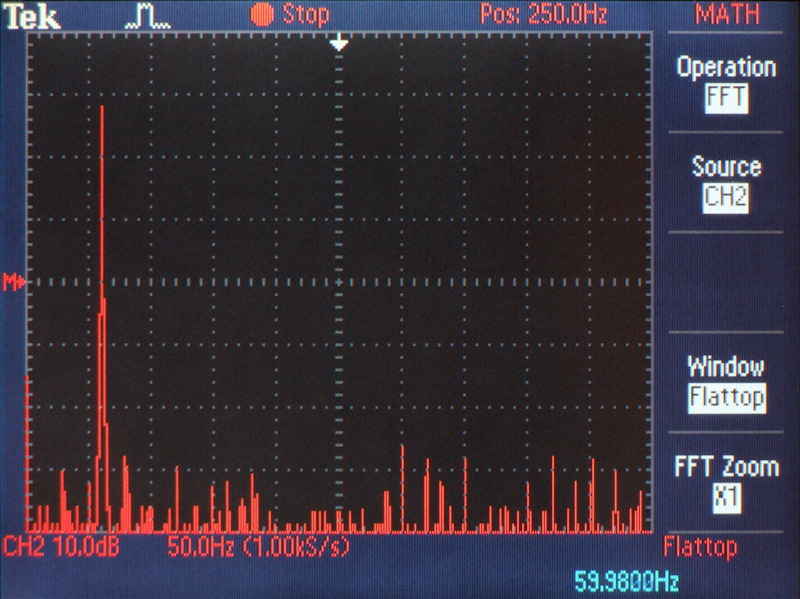 Noise spectrum plot of AC voltage signal from stock Flypower adapter. This abomination generates high levels of even order harmonics (120 Hz, 240 Hz, and 360 Hz) which are not present in the incoming power signal. Nasty! Figure 19. 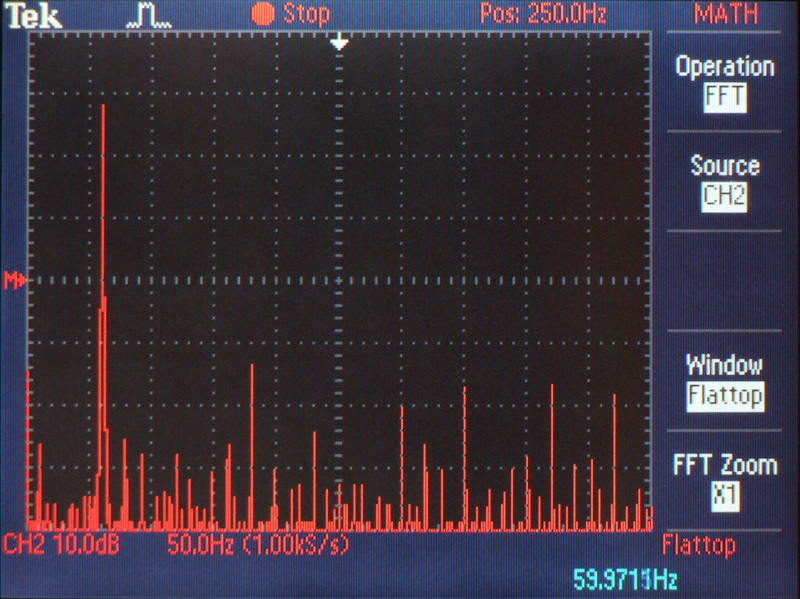 Noise spectrum plot of AC voltage signal from iPower adapter. Much better than the Flypower adapter...and no large amplitude even order harmonics. iFi audio claims to use an active noise cancellation circuit, along with a 12-element noise suppression circuit. Wonderful!! An alternative to the switch mode power supply is the linear regulated power supply. For audio applications, a linear regulated DC power supply would provide the best low noise performance. However, high performance linear DC power supplies are significantly larger, significantly more expensive, significantly less efficient, and some have acoustic noise issue (fans). The iPower power supply offers some of the low noise benefits of a linear power supply along with the low cost and small size benefits of a switch mode power supply. Based on the results of this study, it would be worthwhile to look at some linear power supplies that might be suitable for this audio application. The next addendum report will evaluate upgrade USB 3.0 cables for the hard drive enclosure. Mojo Audio makes very good linear power supplies. Another great report @DarqueKnight and as always, well written. Lot's of data, which I love. On the lookout now for iFi power supplies! Great job man! Can these be used on a Schiit Mani??? phono stage, or straight to a notebook pc? Or to replace the wall wart that feeds my cheap TT? 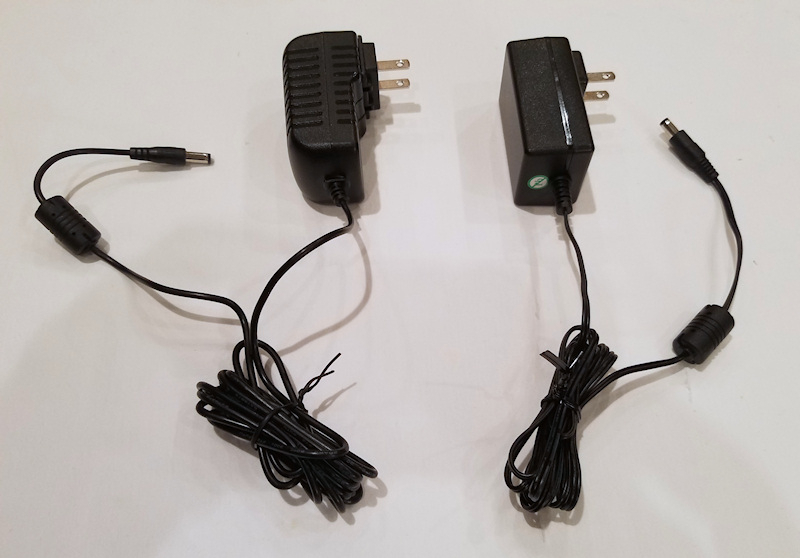 Generally, any AC-to-DC power adapter that meets the voltage and current requirements of your device should work with your computer equipment. This should also be true of your audio equipment. However, I would check with the manufacturer to be sure that there won't be any problems with using a different adapter. In the case of the cheap turntable, I would be surprised if the manufacturer went to the trouble of selecting a low noise adapter. Nice review. I've used the ifi iPower for some time on my Wyred Recovery USB reclocker that sits in front of my DAC. I felt it was money well spent. Cleaner overall sound than the stock wall wart.